At the base of the Sangre de Cristo mountains of New Mexico there is a quiet place conducive to meditation and the practice of the Buddha Dharma. Building the Kagyu Mila Guru Stupa began in 1992 under the kind direction of Lama Karma Dorje, resident lama at Kagyu Shenpen Kunchab Center in Santa Fe. Land, money and labor for the stupa came primarily from students of the meditation teacher, Herman Rednick (1902-1985), whose teachings blended Eastern and Western meditation concepts. The Kagyu Mila Guru Stupa is a memorial to Herman Rednick. It was completed in 1995 and in June of that year was consecrated by the V.V. Bokar Rinpoche, accompanying six year old Yangsi Rinpoche, tulku of H.E. Kalu Rinpoche. Lama Karma Chödrak is the Tibetan lama in residence. From March through September he conducts daily practice at the Herman Rednick Center which is also presently his home. From October through February he travels to India where he organizes the Monlam Prayers held annually at Bodhgaya. For 2 years Lama Chödrak has led a ten day Ngondro retreat here and he leads weekly meditations in Taos, as well as special retreats and meditations at the Tashi Gomang Stupa in Crestone, Colorado.  The Bath House is an essential structure in our development plan. It is the nexus for all present and future utilities, including water, electricity and septic for the stupa, lama house, retreat cabins & gompa. The Bath House which includes 2 public bathrooms and a kitchen for retreatants is more than 1/2 completed.  Our next priority is to build a small, private house near the Stupa, for Lama Chödrak.  We are planning a Gompa or Buddha Hall which will hold up to100 practitioners and serve as a place to house the Kanjur.  The Stupa needs a porch to protect the entrance and to serve as a sheltered place to remove shoes.  We also want to build some retreat cabins for those attending events & also for more extended retreats. As our community of less than 20 resident members strives to meet the needs of our center, from hosting visiting teachers to building more facilities and providing minimal living expenses for our lama, we find that we must reach out for your financial support. We have not had to seek for funding in this way before, but with increased activity, much is changing, and our small community is unable to provide all of the resources that we need to create a beautiful and vital Dharma practice center. 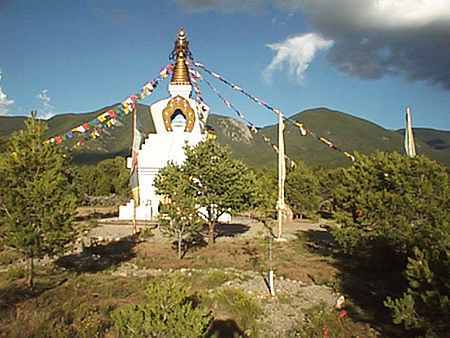 We have a non-profit 501 C-3 corporation, which owns and maintains the Stupa and the land surrounding it. Created by the students of Herman Rednick in1981, Earth Journey Inc. gives your donation a tax deductible status. We sincerely thank you for any contribution you are able to give toward turning the wheel of Dharma in the mountains of New Mexico.